No Torah Study for me today. After last week’s Jewish Journal article in which I gushed about Rabbi Bernstein’s Friday morning ancient-history-philosophy-religion-mythology-spirituality-and-parenting seminar, I felt sheepish to miss today. I had wanted to go, but at the last minute the second graders needed one more driver for their field trip. I hadn’t said yes the first time the call for drivers came out, because the idea of an 8-12 field trip seemed too much of a commitment. But I had a car, I could make the time, so I raised my hand and said I’d do it. Thank goodness. I was headed to the Getty Villa with fifty second-graders. Talk about ancient-history-philosophy-religion-mythology-spirituality-and-parenting skills. Have you tried to corral rambunctious seven- and eight-year-old boys through a palace of priceless sculpture? The morning was filled with many pleasures, however, not least of which was the drive. It was the first time I’d needed the third row of my Toyota RAV4. This is a big deal to me. I chose this car in anticipation of our move to Venice. Guessing that parents wouldn’t relish having to drive their kids from the old neighborhood to our new house, I bought a practical, 3rd row SUV so I could take everyone. This was instead getting a wildly impractical but super fun convertible, which would seat just us four! I repeat, I gave up a convertible in order to ferry many children. And this is the first time I have ferried. Bitter? Not at all. Listening to the five boys in my car was another highlight. It wasn’t the topic (Lego Ninjago, which was pretty funny) as much as the passion they brought to it. And their jokes. And the screeching laughter. Their excitement was electric. All it took was being out of their normal, run-of-the-mill classroom environment, on an adventure. Leaving behind routine is implicitly awesome. That’s why I love travel. Finally there was the Getty Villa itself. 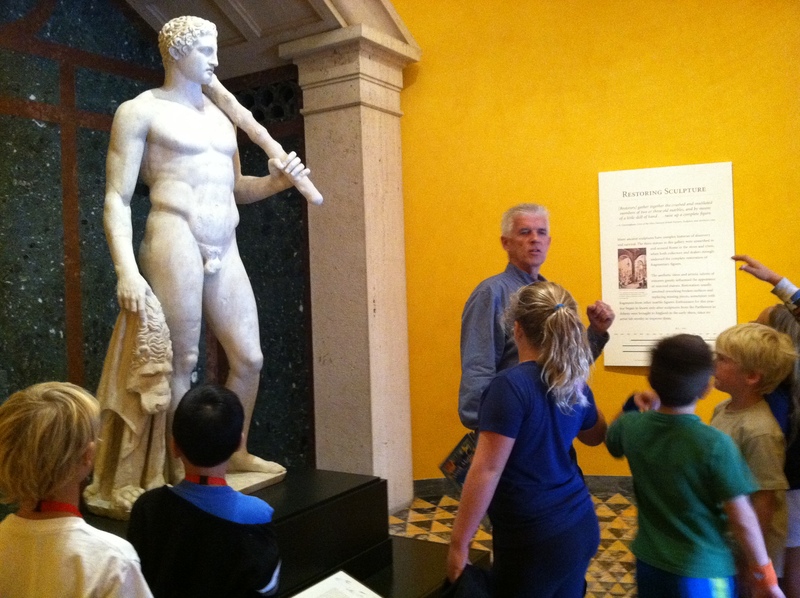 Our docent, Rick, carried a children’s book of Greek Mythology with him, which he read from to make the art come alive. He told them the story of Herakles slaying a lion, strangling it with his sheer strength, then brought them to the statue of Herakles holding a lion skin, a statue which inspired J. Paul Getty to build the whole museum. Second graders reenact the lion slaying. He sat the kids in front of an ancient stone mosaic floor with a Medusa in its center, and then he read the story of Perseus slaying Medusa. Now that stone mosaic meant something. The same with a sculpture of sirens. Yeah, these may have been cool to look at for a minute or two, what with their bird legs and feathers on the bottom, female bodies on top. But add to that the story of Orpheus sitting on a boat and playing his instrument (the original “guitar hero” in Rick’s words) in order to drown out the sound of their tempting, dangerous singing and thereby save the lives of the sailors, well, now the kids were hooked. I loved hearing how much my son knew about the Greek myths. He raised his hand to answer all sorts of questions: “What power did Medusa have?” “What did a siren do?” “What is a sickle?” I give thanks to author Rick Riordan for writing the Percy Jackson books, and to whomever wrote and illustrated the Greek Mythology comic book Emmett has been reading in the school library. I give thanks for school libraries. I give thanks for the opportunity to see him in his element, to get out of my own normal, Friday routine and experience some surprise, and to be reminded of the power of stories to capture imaginations. Which is, after all, what Torah is all about. Our stories — heros, villains, folly, morality. The human experience of the supernatural. Okay, then. Chew on that. Class dismissed. Have a great weekend.